Update – I’ve added a new figure Fig. 4a below, a version of the AR5 SOD Fig. 1.4 with the “grey swoosh” redacted. Today, after giving my opinion on the subject of Syria, my sister told me I was being, “Negative, pessimistic, and paranoid” – all possibly true – but being a scientist I am driven to that position by the apprehension of the evidence. Ed Hawkins tweeted up the latest offering from the MET-Office this morning. It’s a “Decadal forecast”, which runs from now to the beginning (not the end, Ed) of 2018. Stop tittering at the back there! 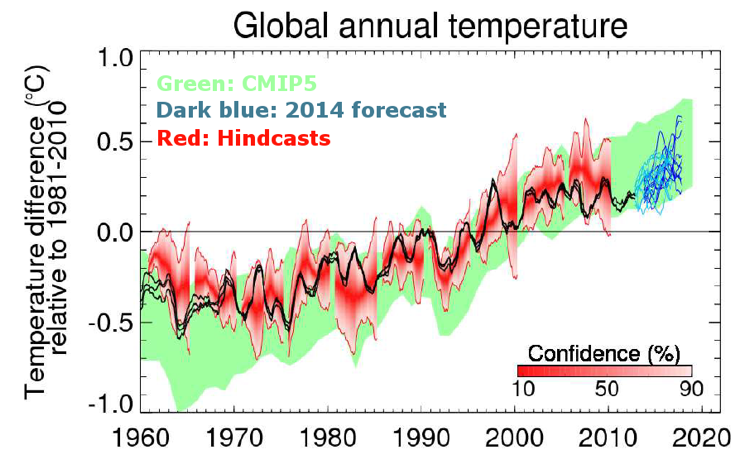 But compounding matters, the ‘forecast’ is a spaghetti of similarly coloured lines. I said STOP LAUGHING! I thought the MET-Office was getting out of doing these longer range forecasts they’ve had so much trouble with them the last many years, not that I pay any attention to them since it seems that Met Office Global Forecasts Too Warm In 13 Of Last 14 Years. And, if that’s not enough just scratch the surface of this iceberg. Actually, that wasn’t the very first thing I noticed, what I noticed immediately was the curious way that the graph was constructed, namely that visually the tag end of the graph from 2010 on functions as graph within a graph. Its actually a little like a fractal – self-similarity at different scales Maybe you noticed that too.